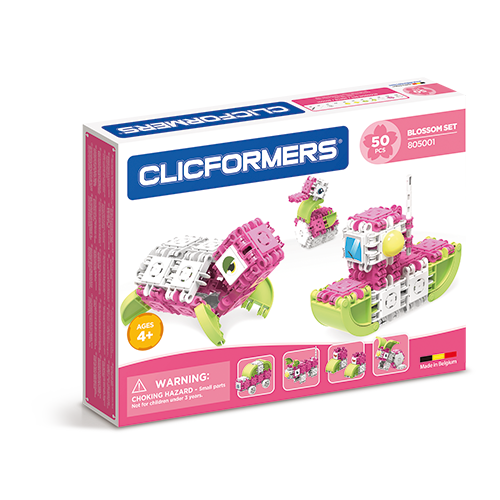 The Clicformers Blossom 50 pcs construction set is the ideal building toy for girls. The Blossom series from Clicformers combines the unique clicking system of these building blocks with a new, fresh look and soft colors. With this Blossom 50 pcs starter set, your child can build a whole zoo next to a sailing boat, boots, a car or even a vacuum cleaner. The booklet included in the box contains detailed building plans for a rabbit and a turtle, among other things. You can download more step-by-step plans online, which means that the animal collection of this Blossom 50 pcs pack is expanded with a cute puppy and a swan. The hardest part will still be choosing, because all Blossom 50 pcs creations look equally handsome and invite you to get started right away with the Clicformers building blocks. It’s hard to believe that educational toys can really be fun! The Blossom series of Clicformers proves it – an irrestible STEM toy!